Catch up on the moves you might have missed as the smash-hit sensation Just Dance Greatest Hits is unleashed. 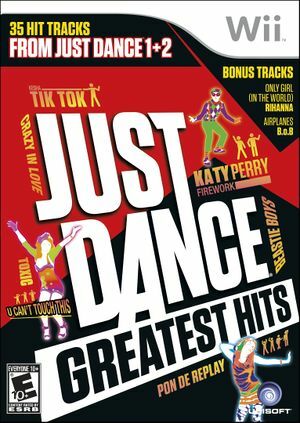 This collection pulls an all-star track list from four Just Dance games, creating a decades-spanning set of 35 unforgettable songs. Choose from recent chart-toppers from Rhianna, Katy Perry, Outkast, and Britney Spears, or flashback with classics like "Fame," "Eye of the Tiger," and more. Jump right in and groove to the music with help from an on-screen coach. Mix things up with multiple game modes for up to four players, including Simon Says, Medley, Just Sweat, and Just Create, or cook up your own ultimate custom playlist. The graph below charts the compatibility with Just Dance Greatest Hits since Dolphin's 2.0 release, listing revisions only where a compatibility change occurred. This page was last edited on 10 February 2018, at 05:46.